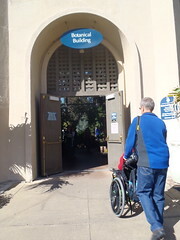 The Botanical Building is a nice garden inside an interesting lath structure building. We enjoyed walking around it and photographing the flowers. 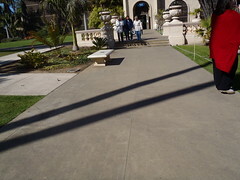 The garden is accessible with the pathways all being wide enough and the doors to the building were propped open. Mik had one minor complaint as we approached the building from the lily pond out front. It was that there were two steps up before you got to the building and he did not think there was a ramp. Both sides of the pond have the steps and both sides have a ramp off to the side of where the steps are. It is pretty obvious once you get to the steps. I noticed the ramp a ways off, but apparently from Mik's position in his wheelchair it was not obvious until we got much closer.